By KM, this testimony comes from a patient in rehab who struggles from the cyclical vomiting syndrome associated with marijuana. CHS symptoms lead me right into rehab. Morphine was the only thing that helped when they cut me off morphine I started getting pills off the street. I found cocaine helped so I was doing it everyday just to make it stop. Finally, I graduated to heroin and fetanyl and let me tell you the dope sickness plus CHS is a real treat. I was in denial for 6 years I was actually told I had Cannabis Hyper………whatever Syndrome, CHS, but was so confused cause pot actually seemed to help. I’m a little more than a month into rehab and I’ll tell you I already notice the difference. The problem is you’re sick for so long you forget what it’s like to live, so you keep on going back to the old ways and smoking pot. You lose all of your friends and jobs. You begin to isolate and you bond with the only thing that will bond with you and it turns out to be the drugs. I remember screaming and crying in the shower. Begging strangers to rub my back in an emergency. Going to the psych ward because I would freak out and try and kill myself. I’ve even asked to be a case study so other people can get information. If it doesn’t get better after a few months maybe it’s something else. But try and rule this out and then the doctors can take a better look at you. But if you find yourself taking frequent showers, that is a pretty much dead give away. I hope you all luck and I wish I could take this pain away from you but sadly I can’t. Only you can help yourself by taking 3 months out of your life and quitting pot. 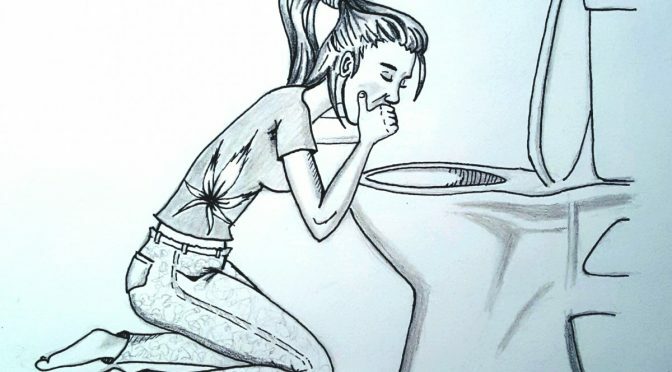 The information in this testimony backs up some of the information we shared from a previous blog article, Cannabis Hyperemesis Exposed: Toxic Side Effect of Dangerous Drug. In San Diego, Dr. Ronnet Lev’s explained the vomiting during a press conference against Proposition 64.